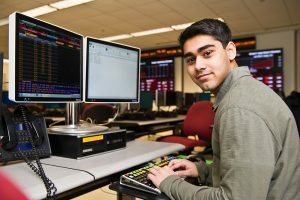 The Wall Street Trading room at Saint Joseph’s University Haub School of Business supports the financial education of our students and provides them with the knowledge and skills required for competing in a global job market. The room provides access to electronic sources of financial and investment data, analytical tools, and trading simulations. The room allows hands-on learning, curriculum enhancements, and more effective class projects. Trading simulations provide opportunities for real trading experiences. Continuous access to financial data and software provides an integrated learning environment to focus on analysis, synthesis, and evaluation.